What a pleasure it is to welcome Emily to the blog today. We’d do well to remember her sound advice not only at Christmas, but all year. 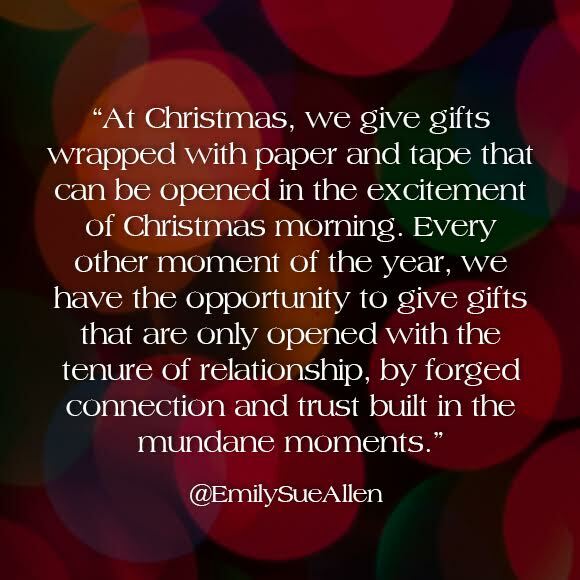 Emily Sue Allen is a writer, photographer, creative and homeschool mom. She lives with her husband and six young children in Seattle, WA. Her days are full of laughs, epic messes, and lots of learning alongside her kids. 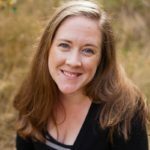 She is passionate about the transformative work that God does in the quiet spaces of the heart and she writes about all of the above at lightandloveliness.com. Beautiful, Emily. Love your generosity perspective. While I am not blessed with children, these thoughts will linger in my heart & infuse the moments of the relationships God has given. Thank you so much for stopping by and reading Emily’s words! What a beautiful reminder to love our children well with our moments of time. My children are mostly past the cuddling stage, but every once in a while all 6-foot of my sweet boy will snuggle up close with his head on my shoulder and just need that time. I treasure those moments so! The days they wanted to be attached at my hip are long past and I often miss them wishing I could rewind time and grab just another minute of those snuggles! Lori – Thanks for reading and for the reminder that these years are short! This touched me deeply as it was validating and spoke what I have been feeling in my heart. ‘I don’t always make the gracious choice. In my heart, I want to, but tiredness, busyness, and spread-thinness impedes my ability to give my children my best at all times. Most often, I am stumbling through parenthood, powered by love, but not always able to get the tenderness I feel for my kids to show through gentle actions and encouraging words.’ Thank you for sharing on this. My prayer will be that God will give me strength to give generously this gift of patience, kindness, gentleness, and self control to my children ( who all too often get what is left and not my best self) throughout the year. Thanks for writing! Laura – Thanks so much for your comment. I am glad you were encouraged by this quote. I will pray with you for God’s strength to pour into your children, and for His grace to cover you when you mess up. I rely on His grace daily!